Best Pizza in Utah: Our 10 Favorites! It’s almost impossible to meet someone who doesn’t love pizza. No matter who you are, where you’re from, or what you think you like to eat, the odds are typically in pizza’s favor. Fortunately for pizza-crazed Utahans, the Beehive State is home to some delicious pie. So if you find yourself in Utah, and in need of a slice of the good stuff, try one of these 10 pizza restaurants. With recipes and ingredients hailing straight from Napoli (as well as other specialty regions in Italy), Settebello is gourmet pizza at its finest. With its first location in Salt Lake City, the restaurant has since spread to Nevada and Southern California. 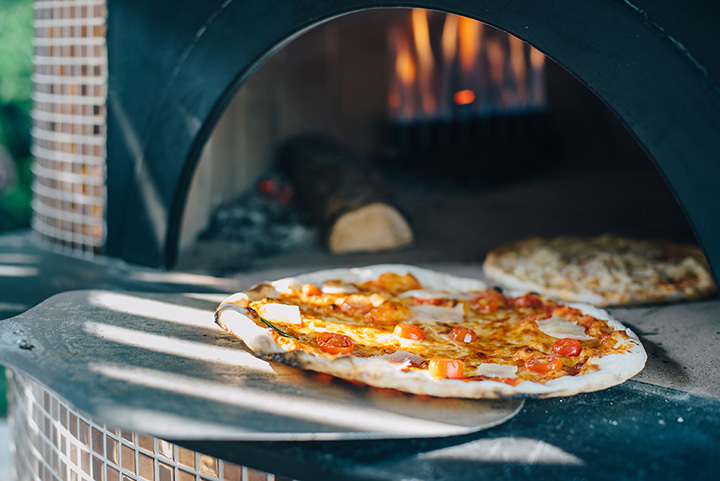 Each pizza from Settebello is a unique piece of art straight from an authentic wood-burning oven. SLAB is not your typically pizzeria. Pizza is sold by the “slab,” which comprises of two generously large pieces of thin crust pizza loaded with delicious flavor combinations. Cult favorites include classics such as pepperoni and Hawaiian, but extend to more adventurous pairings such as rosemary potato and chicken cordon bleu. A Salt Lake City landmark since 1980, The Pie Pizzeria is kitty corner to the University of Utah campus. The pizza is thick, satisfying, and classically American. And while the pizza certainly is delicious, the underground fraternity vibes are equally memorable. One of the ritzier pizzerias in Utah County, Pizzeria Seven Twelve makes for a classy dinner for adult pizza lovers. With patio seating and the most scrumptious seasonal corn on the cob, this restaurant is a definite upgrade from your typical pizza joint. Nicolitalia Pizzeria serves up Boston style Italian pizza for the college communities of Provo and Orem, Utah. With cook-at-home options as well as competitive take-out deals, you have to wonder why anyone would ever choose to buy pizza from a large chain ever again. Right next to one of Utah’s most popular vacation and family reunion destinations, Bear Lake Pizza Company is the perfect accent to a long, sunny day on the water. The environment is warm and the servers are incredibly accommodating for large or small parties. When people think of pizza in Provo, they often think of Brick Oven. Why? The restaurant has been around for as long as alumni of Provo’s Brigham Young University can remember. With tacky Italian indoor decorations and a long-standing tradition of quality, Brick Oven is hard to beat. If you go, make sure you order a frosted mug of their famous root beer to accompany your pizza, pasta, and/or salad. A popular pizza restaurant further south, Centro Pizzeria fulfills food fantasies on the daily. Some of their desserts (such as the “Nutella Piegato” which is a pizza dough filled with Nutella and baked in a wood-burning oven before it is topped with whipped cream and served) rival the delicious flavors of their pizzas. Simply put, the Pizza Factory is far from fancy. With locations in Spanish Fork, Lindon, Syracuse, and Provo, this sit-down restaurant is good pizza without the pretention. Statewide, people dream about their twisted breadsticks and large salad bar. Goldfish crackers on your salad? At the Pizza Factory, you can do anything.